Orbit of asteroid 21619 Johnshopkins, on a plot of the inner solar system at the time of its discovery in May 1999. The name that graces some of the world's top research, educational and medical institutions has a new place in space. The International Astronomical Union approved the name "21619 Johnshopkins" for the asteroid once known as 1999 JN136, honoring the 19th-century Maryland entrepreneur and philanthropist whose bequest established The Johns Hopkins University and The Johns Hopkins Hospital. Scientists announced the designation last week at the international Asteroids, Comets and Meteors meeting in Baltimore, hosted by the JHU Applied Physics Laboratory. "This is a terrific honor, recognizing the many contributions that Johns Hopkins University men and women have made to humanity's knowledge of the world, the solar system and the universe. We really appreciate it," said President William R. Brody. "In our first 14 decades, we've grown far beyond Baltimore to include campuses around the world. We've designed, built and operated satellites in outer space. But an asteroid brings a whole new meaning to our far-flung mission!" 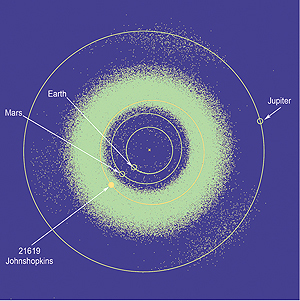 Asteroid Johnshopkins is about 2 to 4 miles wide and orbits the sun in the main asteroid belt between Mars and Jupiter. It's currently more than 290 million miles from Earth, and you'd need a powerful telescope to even glimpse it. The asteroid joins a collection of natural objects — at home and in the heavens — named for Johns Hopkins institutions and people. Johns Hopkins Glacier is in Glacier Bay National Park and Preserve, Alaska, near Johns Hopkins Inlet. An asteroid is named for APL, and a constellation of seven asteroids bears the names of Applied Physics Lab researchers who worked on the historic Near Earth Asteroid Rendezvous, the first mission to orbit and land on an asteroid. Ted Bowell, whose team at Lowell Observatory in Flagstaff, Ariz., discovered asteroid JN136 in May 1999, proposed the new moniker. To track the asteroid through space, go to: ssd.jpl.nasa.gov/sbdb.cgi?sstr=1999+JN136∨b=1. GO TO JULY 21, 2008 TABLE OF CONTENTS.